Initially, I thought I understood what the exhibition Additionals from Celine Condorelli at Project Art Space, Dublin, was all about. The five sculptures on display; Structure for Communicating with Wind, Structure for Listening, Structure for Preparing the Piano, Structure for Reading and Structure for Public Speaking make up a small and well formed presentation of exploration into how sculpture can have agency in ways other than simply 'the art object'. A well trodden path certainly but I thought it was a rather nice show. It was only later when I left PAC and had a read of the exhibition guide (being in a rush and too wordy to look at during the show) did I realised how wrong I was and begin to unravel the complexity of what's actually on display. A large crinkled silver curtain, made of space blacket material hangs in the centre of the Additionals. Structure for Communicating with Wind moves gently in the breeze as people walk back and forth and the door opens and closes. Next to this Structure for Preparing the Piano looks a bit like a work bench with a desk lamp on top. 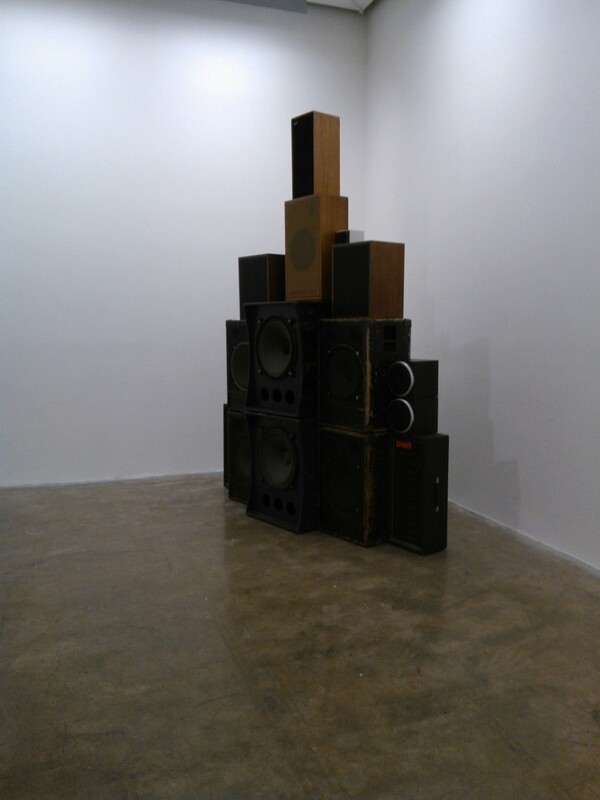 Structure for Listening is comprised of a stack of speakers reminicent of an Andy Holden work making buzzy noises and next to this Structure for Public Speaking is a steel structure that functions as a podium with slanted mirror film installed above where the speaker would stand. This mirror film also allows for the audience to see what document the (potential) speaker is reading from and, although a speaker is absent, there is a document laid out. This depicts each sculpure on display along with a rather confusing explanation as to its purpose. 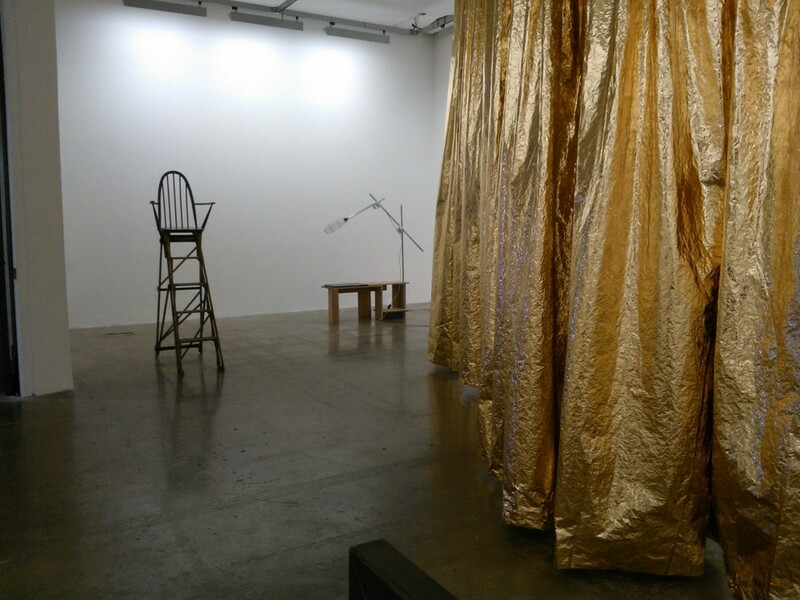 For example, the text under Structure for Communication with the Wind says 'A space blanket curtain provides presence to what passes unseen and unheard; the abstracted form carrying Wind's news to Tiger, silently'. Similarly Structure for Listening references a character 'Tree' and Structure for Public Speaking – 'Circle' and someone called 'Amy'. Who are Wind, Tiger, Circle and Amy? 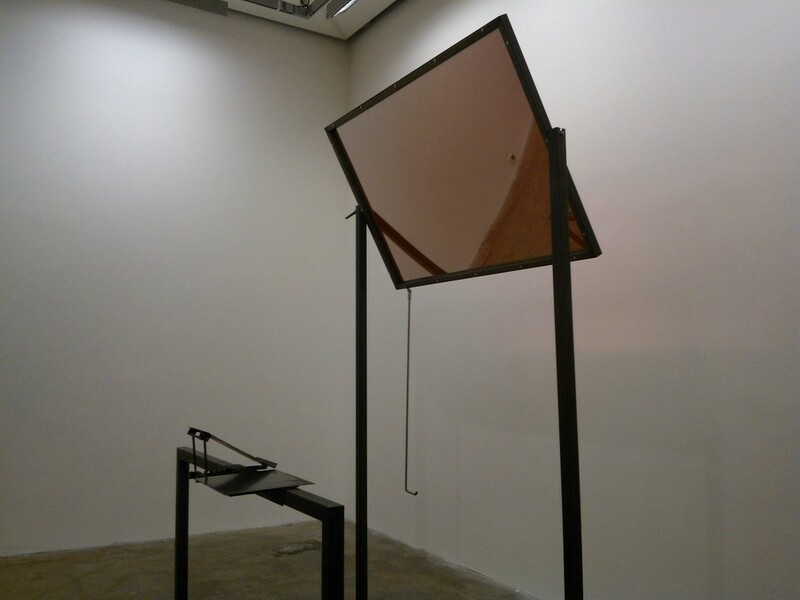 According to the exhibition guide, Condorelli has created a series of sculpures, or a 'cast', resulting from her 'journey' with the British avant-garde composer Cornelius Cardew's text score The Tiger's Mind which is also a work-in-development for the Dublin based theatre artist company – The Company. Condorelli was initially cast in the role of 'Tiger' by filmmaker Beatrice Gibson and typographer Will Holder in their previous project using the score and it is her journey as this character that informed the making of the objects that form Additionals. Things get a little more confusing - the text goes on to describe the functionality of the structures and their status as art – describing the sculptures as a 'provocative hybrid of form and function' and further describing them, with reference to Michelangelo Pistoletto's theory of The Minus Objects, as 'further provok(ing) questions around the artness of art objects'. I didnt find anything particularly provocative about the Additionals and/or found they provoked any particularly interesting questions. They are sculptures that have a function as something other than art but is that what still considered as provocative today? Alongside this information is further illumination into the process undertaken by Condorelli and her collaboration with The Company. The Company are made up of three theatre artists; Nyree Yergainharsian, Jose Miguel Jimenez and Rob Mcdermott who 'Aim to make work that changes how theatre is made and seen by looking and learning from the everyday'. PAC is not just a white cube exhibition space but also home to all forms of performance and two black box theatre spaces and this project is obviously conceived to marry the disciplines represented within the building. The Company are using the Additionals as both a site for generative process and the sculptures within the exhibition as their cast. I didnt see any evidence of this process during my visit beyond the document placed on Structure for Public Speaking that references the characters in the score. There are also no events or particular moments where this process would be made visible to the public flagged up on the exhibition material. It could be that activity just pops up impromptu but it would be useful perhaps for the audience to know how and when the manifestions occur. This exhibition will appeal to visitors who have a particular interest in Cardew's score, the work of The Company or have read Condorelli's 2009 book Support Structures. Personally, having almost zero knowledge of any of these, I found the exhibition rather incomprensible after reading the guide. The more I read, the more baffled I became. I was frustrated with some of the more nonsensical and un-necessarily complex and sometimes grandiouse language used and what was physically on display gave me little or no access points into the true themes of the exhibition. One wonders why Additionals has to be so complicated. You have until 18th Jan to make up your own mind.